Week 4 went pretty smoothly. I still have all my fingers and I didn't burn myself. My poor teammate Tracy, unfortunately burnt herself on that same scary convection oven - it's a beast. She currently has about a 3 inch long scab on her right wrist. It's nasty and looks horribly painful. Hopefully it healed up nicely over the weekend. This week brought about the revelation that I loath making stock. Yes, I know it's straight forward, but something about it makes me fume with rage. I can't put my finger on why, I just know that every day that involves my team making stock I go home disgruntled. I'm working on making stock be less unpleasant for myself. We had a couple of awesome visitors this week. First we had Gonzalo Guzman, of Nopa/Nopalito, come to class and tell us about how he chose the food for the menus, and how certain items are made. We help grind up corn for masa which was then turned into sopas, and corn tortillas. He made a couple of really awesome hot sauces and showed us how to pickle onions just using lime juice. It was a really awesome demo, and we all enjoyed awesome food at the end. And to finish up the week, on Friday Eugenio Jardim taught us about wine tasting. We learned about how every wine tells a story before you even taste it. Soon I'll be able to sound like I know what I'm talking about. I will of course have to drink more wine. We made a lot of vinaigrettes and mayo/aioli this week. Infused our own oil with herbs, and just generally emulsified our food. 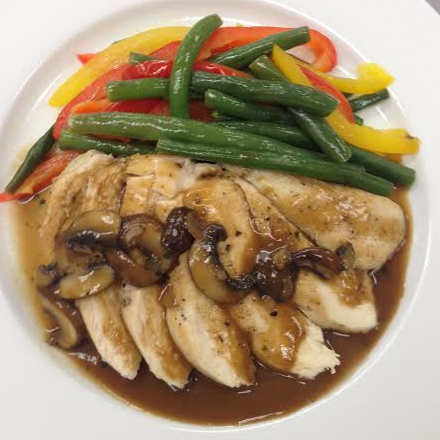 And of course, we had a lovely plated meal day, here is my sauteed chicken with a mushroom pan sauce and veggies. We have a practical exam, and a written exam this week so wish me luck! Buffalo Chicken Cupcakes and the "El Guapo"